“THIS is the third largest herbarium in the country,” says Tariq Husain, herbarium coordinator at the National Botanical Research Institute (NBRI) in Lucknow, as he ushers me into a large space lined by cabinets on both sides. The cabinets are stocked with dead plants, neatly kept in herbarium files. But what is so special about a stockpile of dead plants? I asked. They are repositories of biodiversity, Husain says, adding, “Our herbarium is a confluence of the country’s plant biodiversity.” Herbaria provide information about characteristics of plants and the places where they live. This can help make vital conservation decisions, adds Husain. As Husain and his student Priyanka Agnihotri leaf through the files, they start narrating findings from their multiple field visits around the country. “Due to climate change, trees in Nainital are shifting their altitudes,” remarks Husain, who has been collecting plants for nearly three decades. Species like Berberis asiatica (daruhaldi) and Marsdenia roylei (dudhi lahara), which were found between altitudes of 1,000 m and 1,500 m in 1968 by ecologist R K Gupta who documented the flora of Nainital at that time. The trees have now shifted to about 2,000 m. Some of these plants have important medicinal uses. Daruhaldi has anti-inflammatory, anti-tumour and anti-diabetic properties. Juice of dudhi lahara’s stem can treat gastric troubles and peptic ulcers. Nainital has seen quite a bit of biodiversity loss in recent years, says Agnihotri. Several plant species, including Sophora mollis (sakina) and Aerva sanguinolenta (nuriya), have declined due to habitat fragmentation and overexploitation, he adds pointing out the trend of high-value medicinal plants disappearing from the slopes of Western Himalaya. “On our last visit to Gulmarg in August, we got one or two specimens of European yew (Taxus baccata).” A study published in 1961 in Records of Botanical Survey of India states that yew was flourishing in the region at that time. The tree’s bark contains a substance called taxol that has shown promise in cancer treatment. Taxol is the main reason Yew, listed in IUCN’s plant red list of threatened species, is exploited. Flipping through pages of a herbarium file, Agnihotri points at a specimen of Aconitum heterophyllum (atis), collected from the Rohtang Pass in August. “You can hardly spot it in that area where it used to be once abundant,” she says. Aconitum heterophyllum can help treat malarial fever. The herbarium has less than eight specimens of the species, the first sample dates back to 1909. “We were lucky to find one in Kashmir and one in Himachal Pradesh,” Agnihotri says. Both botanists rattle off names of species that they do not see anymore, Beriberis aristata (tree turmeric) Podophyllum hexandrum (Himalayan May apple) and Picrorhiza kurroa (kutki). “Is it climate change?” I asked. “It could be. There are a number of factors. Habitat destruction is possibly the most important,” says Husain. Recalling his several expeditions to the pass over the years, Husain says the population of Pedicularis has declined. Till 2008, one could easily spot four to five of its species. “You would be lucky to find even three species today,” he remarks. Pedicularis roylei has been wiped off completely from the roadside. “The road around the pass is being widened at the expense of plants,” he adds. General public adds to the destruction. “I have seen people of Lahaul Spiti in Himachal Pradesh pluck medicinal plants for selling,” says Agnihotri. In the Solan valley, barbed wires of a sacred grove were torn down, recalls Husain. NBRI’s herbarium has a lot to offer, but how will it reach the common man? I asked. The institute has started work on digitisation of the data. Information of every specimen in the herbarium would be uploaded on the web database. “GPS would enable the user to identify the exact location from which a particular plant is collected,” says Husain. “This will be helpful because we can go back and see what is happening to the plant now,” he adds. 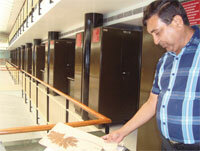 This is the first digitised herbarium in the country and 22,700 specimens are available on the web. This is a small number compared to the 254,195 specimens in the herbarium. The database is a work in progress. Plants will soon be a click away.